In Ethiopia people don’t care much for huge, tender, tasteless industrial style chicken. Everybody, from farmer to university researcher agreed: For good Ethiopian food you need tough and streetwise Ethiopian chicken. This poses a big challenge to the development of the commercial poultry sector: While there is a big market for eggs, farmers and extensionists alike tell us that producing broilers is just not viable because they are so difficult to sell. I have no answer to this. And I have to admit that I had thought much more along the lines of: “How can you develop the market for international chicken in Ethiopia?” instead of asking this much more logical question. Maybe those involved in the chicken industry and agricultural development in the country have a similar bias that “innovation” always has to be the thing that comes from the countries of the developed world? Or is there another reason why it wouldn’t make sense to support the improvement of the marathon chicken segment? That’s the whole content of this post: Net-Map now has a Wikipedia entry. Check it out and change, add, contribute! Do we really need to draw all these links? For the next interview, that we undertook with a private entrepreneur who multiplies and markets improved varieties, we came prepared: We wrote all the actors that had been mentioned in the previous interview on actor cards for our interviewee to choose from. If he thought that some of these were not really important, he could refuse them, if he had others to add, he could do so. 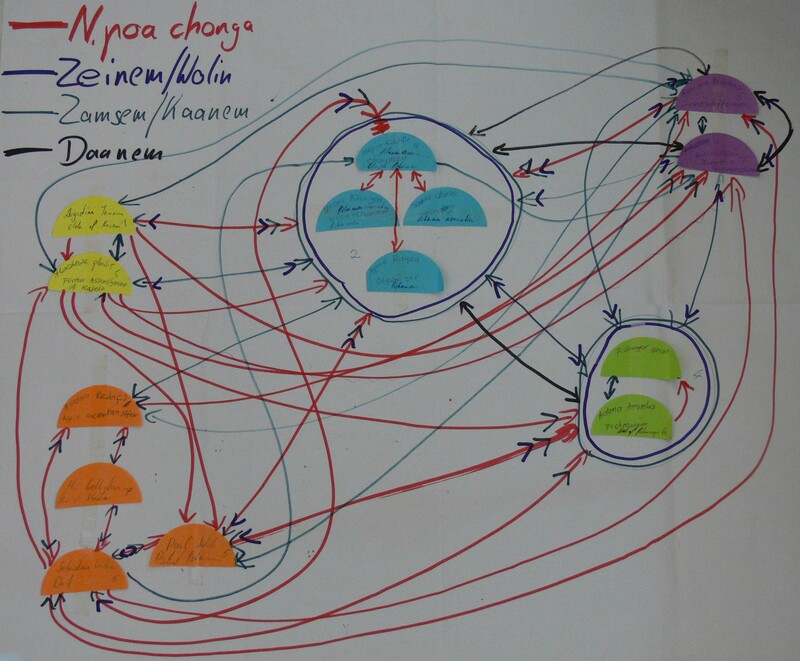 For the next step, we didn’t let him draw networks but just put the actor cards on a map that we had divided into four sections to represent different sectors (public, private, NGO/Civil Society, farmers). Then we asked him to put the actors on influence towers. This did speed things up a bit, but did it also serve our goals of getting a better understanding of the questions we had? After the second interview I discussed this question with my colleagues Regina Birner and David Spielman and we agreed that we learned far less about the “system-ness” of the innovation system, if we didn’t look at the multiple links of the actors. Also, our interview partner seemed to be thinking on a less specific and concrete level. The answer to the question: “Is this guy involved?” is so much more general than following the flow of improved seeds or the lines of command that connect a system. It was through looking at the flows (“So where do the improved seeds go when they leave the laboratory, who has to move them where until the farmer can actually plant them?”), that our first interview partner came up with actors that he had first forgotten. 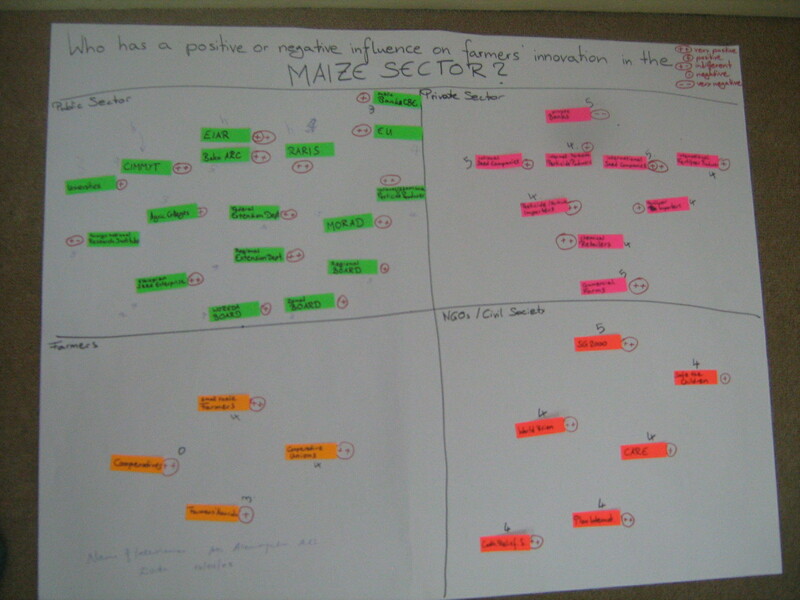 And for us, the concreteness of the network allowed us to clear mis-understandings and preconceptions and evaluate how the system in the Ethiopian maize sector was similar to or different from Ethiopian poultry or from maize in other countries. To me that is the greatest thing about Social Network Analysis, that it is so closely linked to the way that we (or at least some of us) deal with the complex and confusing world anyway and that it just channels and structures it in a way that (slightly…) cleans up the mess and allows us to see the mayor structures in the social landscape. This might be one reason why I have little patience with authors who make it all sound so abstract and difficult to understand that it seems like a secret science rather than a practical tool to better understand the real world. As I mentionned before, I’m in Addis Ababa now, to use Net-Map with my colleagues here to get a better understanding of innovation systems in the agricultural sector. When I woke up this morning, I had no idea about the poultry sector in Ethiopia. To structure and fine-tune our research approach, we drew our first Net-Map about it together as a research team this morning. Then, after lunch, we drew a second one with our first interview partner, a local researcher and expert in the poultry sector. While I am still far from being a poultry expert by this evening, one amazing thing occured to me when thinking about this day: With the step-by-step approach of Net-Map you can be new in a governance field and still interview an expert without making a fool out of yourself. The visualization guides you, quasi automatically, to asking the crucial questions, because you can see where there are gaps in the network or which constellations don’t seem to add up. Because you give a lot of the process over to the interview partner (“Who do you think is influencing this field?” “How are they linked” etc.) they can provide your with information that you wouldn’t have thought to ask for. While today was an interesting day for me as a researcher, it was even more interesting in terms of thinking about implementation. If a donor or NGO came new to this field, just as I did this morning and wanted to improve the situation, they could do the same thing and after a few interviews, within a few days after jumping into this cold water they could feel as confident as the proverbial fish. I can’t hide how excited I am: This blog is going audio! Go to the case study section, click on pod-cast and let me tell you how I developed Net-Map to tackle the challenges that the White Volta Basin Board faces. You know these Russian dolls where a little baby doll sits inside a slightly bigger one that sits inside a slightly bigger one etc.? Sometimes, when doing institutional Net-Maps, I feel like I’m on a Russian tourist market, just surrounded by Matryoshkas. Only that the way organizations are nested inside each other is far more complex and analyzing that is not a children’s game. For example when mapping out the irrigation subsidies system in Chile, we found a number of multi-stakeholder organizations (such as the national and regional irrigation commission), that consisted of members of different ministries, who, at the same time would also provide a council of Ministers, who would govern the whole sector by both, giving directions to the commissions and giving orders to their subsidiary regional and local entities (I don’t have a picture of this at hand, but if you try sketching this just by my description, you will see where the trouble lies). In the above picture you see a related issue, this is a network of individuals and cliques (a clique being a part of a network where everyone is linked to everyone). 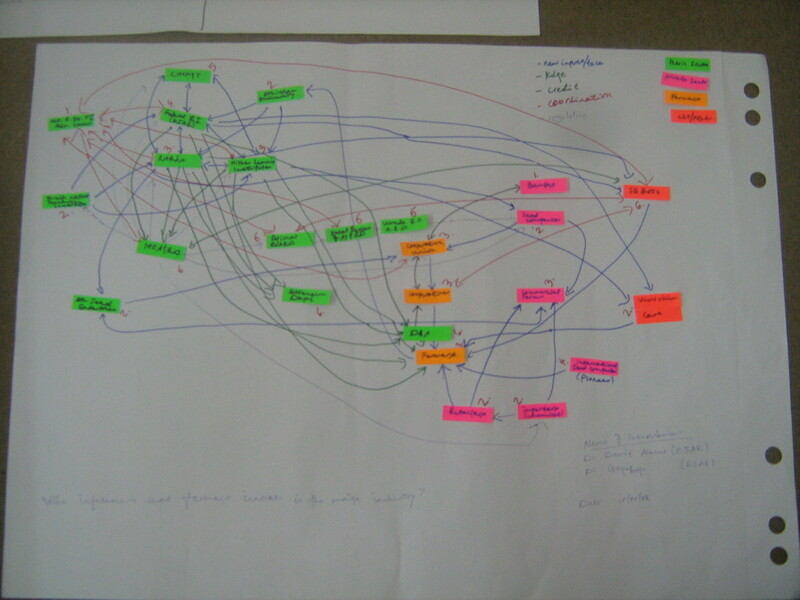 Jennifer Hauck’s visual solution for this problem was to divert from the tedious task of explicitly drawing each and every link that existed: Where ever a group of people would, for example, all share advice with each other, she would draw a circle around them in the color reserved for advice (see case study Fisheries Governance). If someone from outside this clique shared advice just with one member, the link would be between this external actor and this specific internal actor. If they shared advice with the whole group, the link would be between the external actor and the circle around this group. I like this solution because it is time saving (and we must admit that net-mapping does take some time) and intuitively understandable. One might even be tempted to draw overlapping circles, if some actors are part of a number of agencies or a number of cliques with different membership. So why do I call this post “struggling with the matryoshka effect” and not “a great solution for the matryoshka effect”? Because, while this is a great and useful visual representation of the complexities of intertwined social or governance systems, it is not easily transfered into quantitative network analysis. In the work done by other people that I have seen so far, you would always deal with networks of actors on just one level, either individuals or groups/organizations, but I am still looking for a convincing conceptualization of the fact that sometimes individuals from within different organizations will interact with each other, sometimes individuals will interact with organizations as entities, organizations will interact with each other as entities, individuals are members of more than one organization, a unit within an organisation will interact with an individual within another organisation etc. 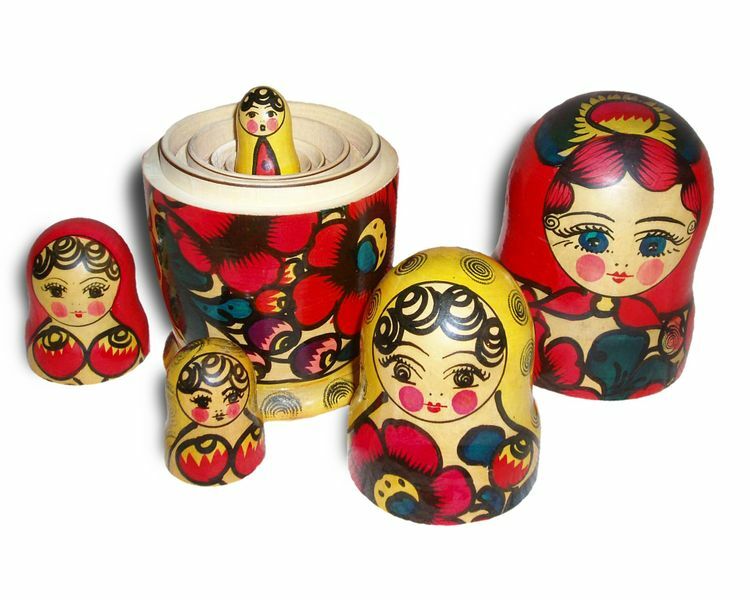 I’m not even sure if I have framed the problem in an understandable way, but I would be really grateful for more ideas and maybe even solutions to my struggle with these Russian dolls.